Chris Emile—dancer, choreographer, and cofounder of No)one Art House—presents a choreographed performance in response to Haegue Yang’s Strange Fruit (2012-13). Chris Emile, Fixed. Image courtesy the artist and MOCA. This entry was posted in DANCE, EDUCATION/ACTIVISM, PERFORMANCE and tagged Chris Emile, Fixed (Emile), Haegue Yang, MOCA, MOCA Grand Avenue, No)One Art House on September 2nd, 2018 by Barlo Perry. In collaboration with the Getty Conservation Institute, MOCA has been conducting – in public – a conservation of Jackson Pollock’s abstract expressionist painting NUMBER 1, 1949 (1949), part of the collection since 1989. Independent conservator Chris Stavroudis will be working in-gallery on the treatment of Pollock’s NUMBER 1, 1949 (1949) on Thursdays in April and May, and will be available for Q&A sessions from 11:30 am to noon and from 5:30 to 6:00 pm. CHRIS STAVROUDIS – JACKSON POLLOCK’S NUMBER 1, 1949: A CONSERVATION TREATMENT, Thursdays, April 19, April 26, May 10, May 17, and May 24. Above: Chris Stavroudis at work at MOCA. Installation view photograph by Brian Forrest. Image credit: MOCA. 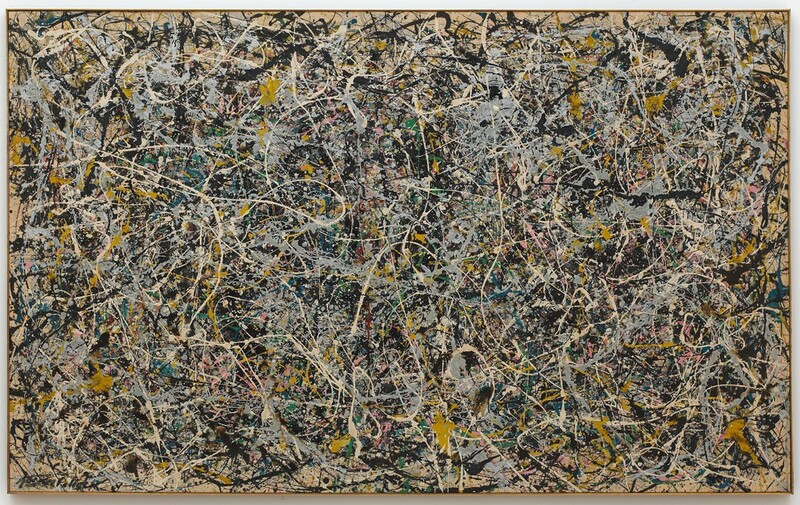 Below: Jackson Pollock, Number 1, 1949, 1949, enamel and metallic paint on canvas, 63 x 102 1/2 in. (160.02 x 260.35 cm), The Museum of Contemporary Art, Los Angeles, The Rita and Taft Schreiber Collection, © 2017 The Pollock-Krasner Foundation / Artists Rights Society (ARS), New York. This entry was posted in ART, EDUCATION/ACTIVISM and tagged Chris Stavroudis, Getty Conservation Institute, Jackson Pollock, MOCA, MOCA Grand Avenue, Number 1 - 1949 (Pollock) on April 17th, 2018 by Barlo Perry.